Step 2: Attempt to get baby to stop crying. 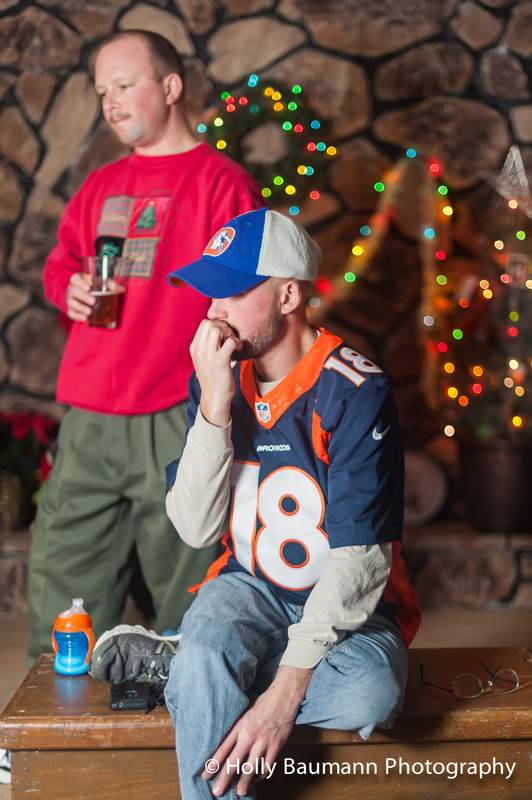 Change into ugly sweaters during a commercial break of an intense Broncos game that your husband would prefer to watch instead of taking Christmas photos. Step 3: Send husband to shave beard, leaving mustache, during a commercial break. Ask equally annoyed but very polite brother-in-law to model so you can test lighting. Step 4: Add increasingly annoyed husband to the scene to set up depth of field during pivotal game moment, in which BIL is actually biting his nails. Allow husband to continue holding his beer. 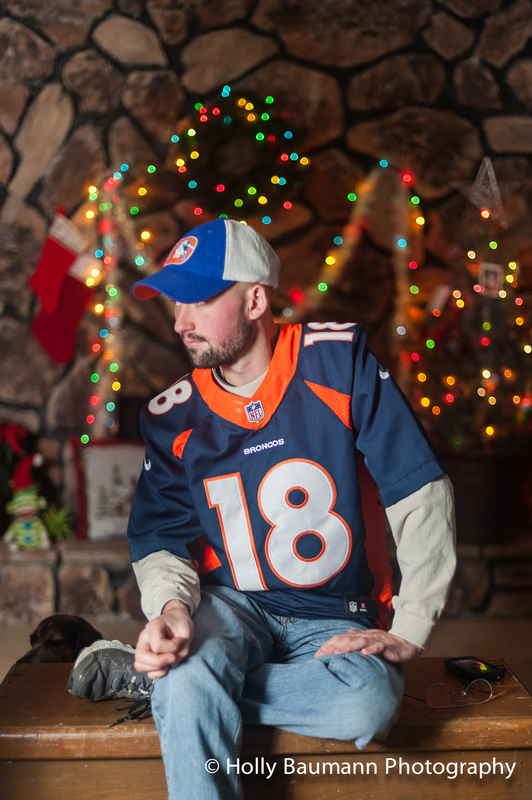 Step 5: Clear extraneous items such as sippy cups and cell phones (which are blowing up with angry text messages from fellow Broncos fans angry about Broncos performance) from the portrait set. Step 6: Pause Broncos game and don ugly 1980s glasses. Frantically attempt to get baby to stop crying again and sit still for at least 2 minutes. Ask patient BIL to fire cable shutter release. 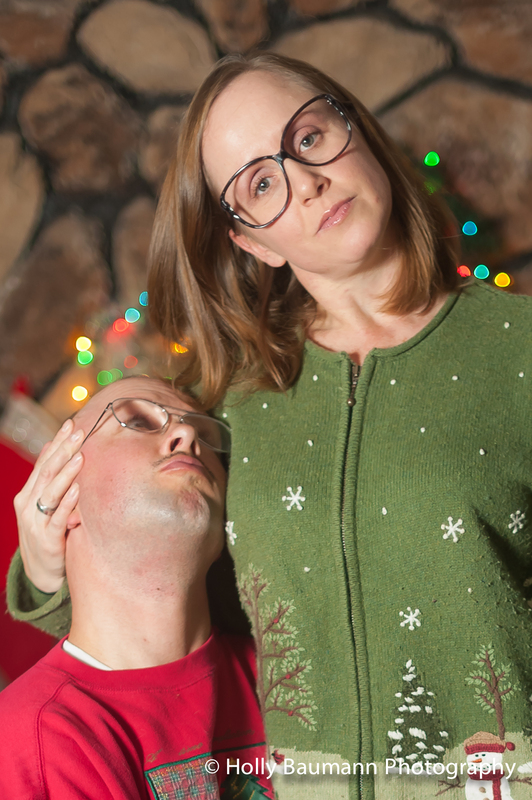 Step 7: Select the most creepy poses, in which husband looks almost too much like a guy that owns a van with no windows, for holiday card. 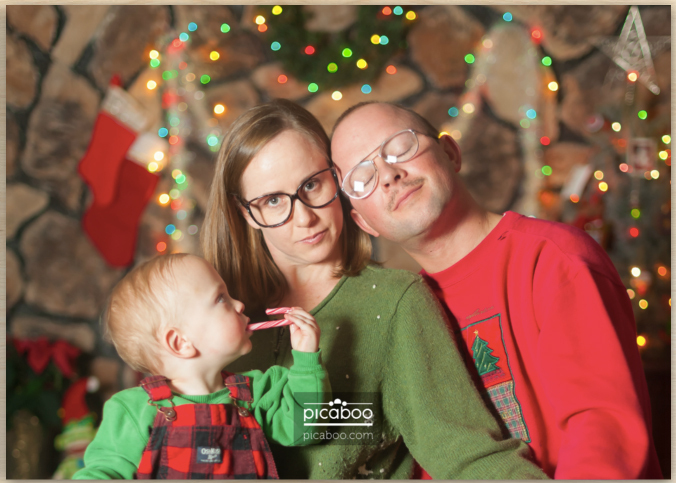 Remove glasses glare for front of card. Create print collage in Lightroom. Make custom card on Picaboo.com. Step 8: Take tacky clothes to back to Goodwill. 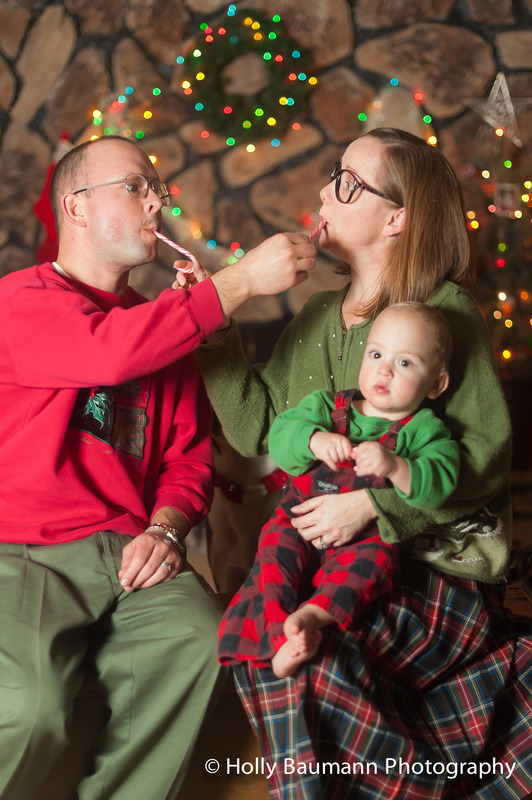 Someone else needs them for an Ugly Sweater Party more than you do. Step 9: Apply tacky holiday-themed return address labels and stickers that arrive every Christmas from various charity organizations on the envelopes to complete the themed mailing. 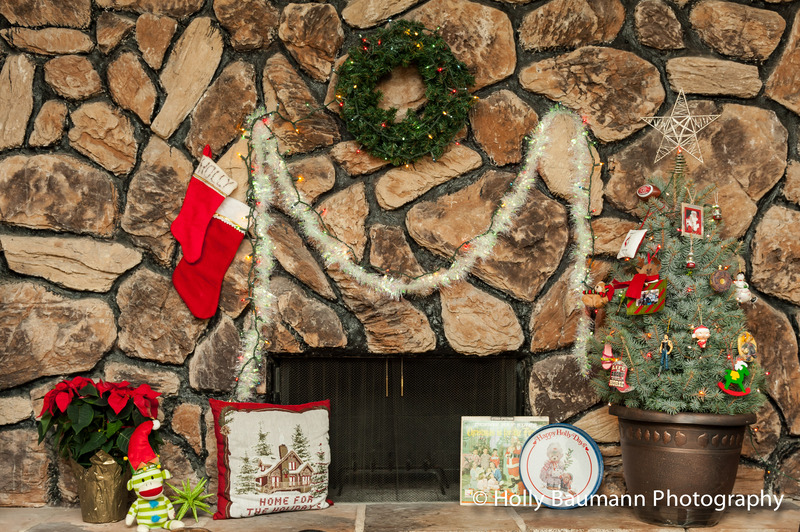 Step 10: Take down tacky decorations and put up real Christmas decorations (optional). Viola. You’re welcome. Merry Christmas! P.S.S. 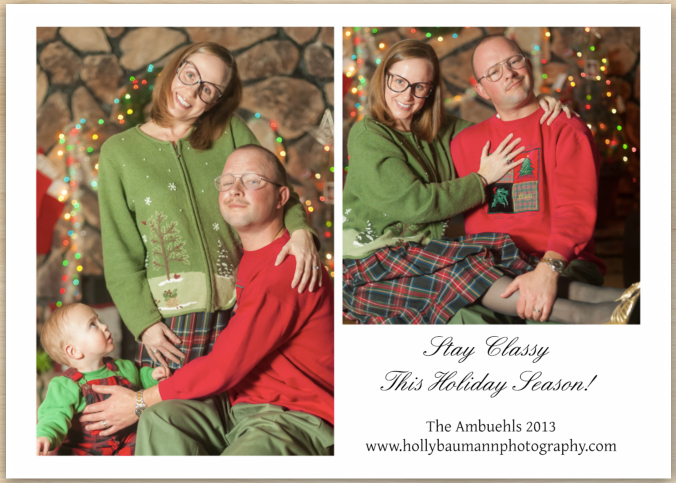 This year’s theme was adapted from and originally inspired by the absolutely classic and brilliant Awkward Family 2010 holiday card designed by Bobbi + Mike. Thanks for the inspiration guys! This entry was posted in Marketing Ideas, My Family, People, Shooting and Editing and tagged Ambuehl, Ambuehl family, awkward family, awkward family photos, Bloomington, Bloomington Architectural Photographer, Bloomington Commercial Photographer, Bloomington event photographer, Bloomington event photography, Bloomington exterior photographer, Bloomington exterior photography, Bloomington fine art photographer, Bloomington fine art photography, Bloomington fine art photography Peoria, Bloomington interior photographer, Bloomington interior photography, Bloomington Photographer, Bloomington photographers, Bloomington portrait photographer, Bloomington portrait photography, Bloomington product photographer, Central Illinois, Central Illinois Architectural Photographer, Central Illinois Commercial Photographer, Central Illinois event photographer, Central Illinois event photography, Central Illinois exterior photographer, Central Illinois exterior photography, Central Illinois fine art photographer, Central Illinois fine art photography, Central Illinois interior photographer, Central Illinois interior photography, Central Illinois Photographer, Central Illinois photographers, Central Illinois portrait photographer, Central Illinois portrait photography, Central Illinois product photographer, cheesy, cheesy holiday card, Christmas, Christmas card, Christmas card ideas, event photographer in Bloomington, event photographer in Central Illinois, event photographer in Normal, event photographer in Peoria, event photography Bloomington, event photography Central Illinois, event photography Normal, event photography Peoria, exterior photography Bloomington, exterior photography Central Illinois, exterior photography Normal, exterior photography Peoria, Fine Art Photographer, Fine Art Photography, holiday card, holiday card ideas, Illinois fine art photographer, Illinois fine art photography Normal, Illinois product photographer, interior photography Bloomington, interior photography Central Illinois, interior photography Normal, interior photography Peoria, Normal Architectural Photographer, Normal Commercial Photographer, Normal event photographer, Normal event photography, Normal exterior photographer, Normal exterior photography, Normal fine art photography, Normal interior photographer, Normal interior photography, Normal Photographer, Normal photographers, Normal portrait photographer, Normal portrait photography, Normal product photographer, Peoria, Peoria Architectural Photographer, Peoria Commercial Photographer, Peoria event photographer, Peoria event photography, Peoria exterior photographer, Peoria exterior photography, Peoria fine art photographer, Peoria fine art photography, Peoria interior photographer, Peoria interior photography, Peoria Photographer, Peoria photographers, Peoria portrait photographer, Peoria portrait photography, Peoria product photographer, photographers in Bloomington, photographers in Central Illinois, photographers in Illinois, photographers in Normal, photographers in Peoria, product photographer, product photographer Bloomington, product photographer Central Illinois, product photographer Illinois, product photographer Normal, product photographer Peoria, tacky, tacky card ideas, tacky Christmas, tacky Christmas card, tacky Christmas ideas, tacky family Christmas, tacky family photos, tacky holiday card. Bookmark the permalink. I laughed so hard at this!!! Awesome awesome all the way … Best wishes for this lovely fun family!